Welcome to our aspirations zone. We are pleased to announce that on 21st December 2017 New Invention Junior School were awarded the 'Quality in Careers Standard' by Prospects. We are one of the first few primary schools within the West Midlands to receive the award. On 14th February we were joined by Michelle Squire and Meena Sandha from Prospects and by Josephine Rivett from Pool Hayes Academy to present Mr Pearson and Mrs Oliver their certificates. What things are important to them? What do they hope to achieve? What new skills have they developed? Each pupil was asked to complete an aspiration leaf which included the above considerations, each leaf was used to create our beautiful aspiration display. These leaves will be used to identify role models who can work with our pupils to ensure that they are inspired and informed about the opportunities available outside of school. 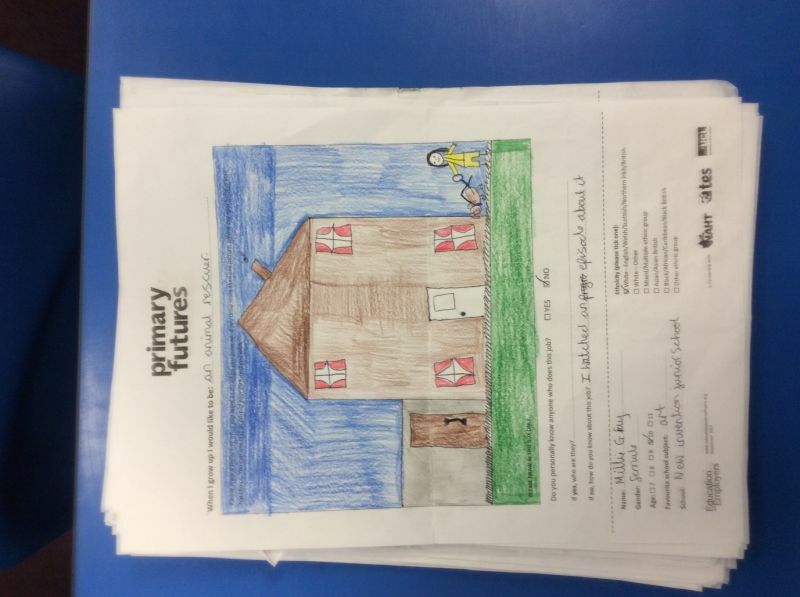 In October 2017 pupils were asked to enter a competition run by Primary Futures, where pupils had to draw and describe what career they wanted to do when they were older. We had some really interesting choices from wrestler, to palaeontologist, to astronomer, to midwife and a fashion designer. 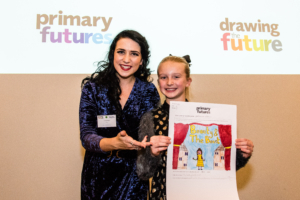 “Drawing the Future is a brilliant initiative which is helping young children begin to think about what they want to do in the future, and realise they can do anything if they put their mind to it. As a dad I want my children to think they can do any job they put their mind to, and as Education Secretary, I want to make sure we widen young people’s horizons so they are aware of the incredible opportunities that are out there. We are currently contacting a variety of companies trying to book dates to deliver some of our most exciting assemblies yet! 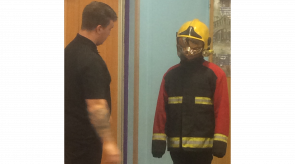 Matt also allowed some of us to try on his uniform and race against the clock to see who could get dressed the quickest. Even Mr Pearson had a go! On Wednesday 6th June we were pleased to host Chloe Jones, an ex New Invention Junior School pupil who is now a professional football player and sports lecturer at Stoke College. 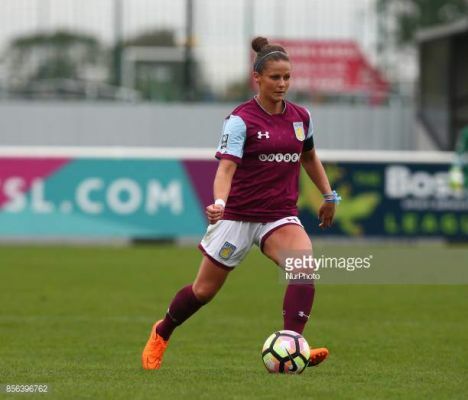 Chloe has played for many well known teams such as Wolves, Aston Villa and Liverpool. Chloe talked to the school about how she reached her dreams of becoming a footballer and what she is working towards next. 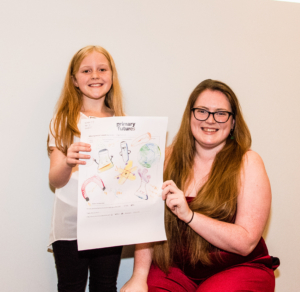 (This includes climbing Mount Everest in 2020) The pupils loved to hear the qualities and skills she needed to reach her dream. 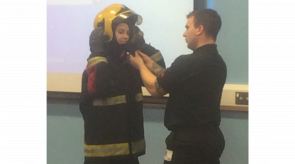 As well as talking to pupils, Chloe lead each class in a training session where they got to experience some of the activities she participates in during her training. On Wednesday 31st January we welcomed PC Lally and PC Ashley to the school to talk to us about what it is like working for West Midlands Police. 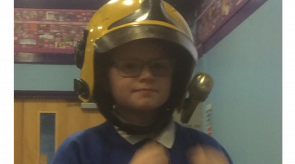 PC Lally and PC Ashley talked about what equipment they use, what a typical day might be like and also what other roles there are with the police apart from being an officer. PC Lally and PC Ashley explained that a large part of their job is talking to people in the community as well as visiting schools, and community centres. PC Lally said that some days she could be walking around the community for 4 hours without a break. On Wednesday 15th November Danni and Jade from Lockwood's Animal Hospital in Willenhall came to visit our school, they talked to us about their jobs as veterinary nurses and also bought in 2 special visitors to meet us. Woody, a King Charles spaniel and Kevin a turtle. Danni and Jade told us about the favourite parts of their jobs and also what kind of things they got up to on a typical day. All of the pupils were very excited to meet Kevin and Woody but also asked Danni and Jade lots of really interesting, well thought out questions. Thank you Lockwood's Animal Hospital for our lovely visit! Our next aspirations assembly will be on Wednesday 31st January 2018 and we will be welcoming representatives from West Midlands Police Force to talk to pupils about their roles within the police and to answer the pupils questions. Your class teacher will guide you on the process of applying for a place at your preferred secondary school, we advise you to attend any open evenings so that you can see all of the facilities, meet the teachers and get an idea of the strengths of the school. 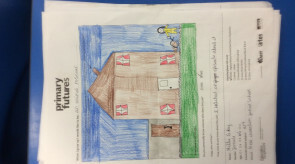 School websites are a great place to start. If you would like more information on your future aspirations there are some helpful links below or come and have a chat to Mrs Oliver.